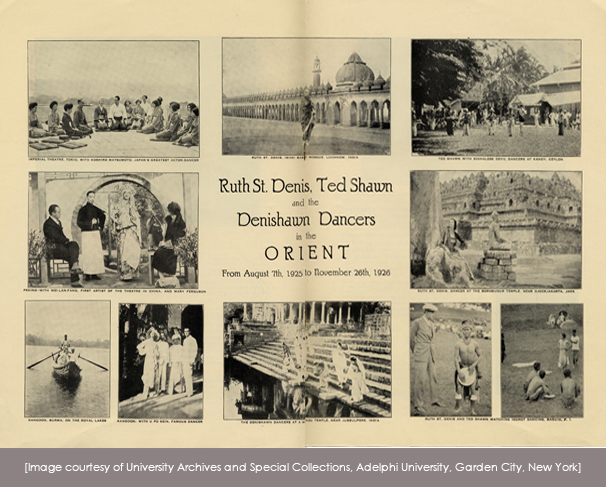 The Denishawn tour of the ‘Orient’ in 1925-26 was a 15-month adventure that transported Ruth St. Denis, Ted Shawn and their Denishawn dancers far and wide – making stops in Japan, China, Burma, Singapore and elsewhere throughout Asia. Our own journey for this film did not aspire to cover all the same ground (or seas!) as the original touring group but instead focused on select highlights of the Indian portion of the Denishawn tour. Our selection of locations was based on detailed diary entries made by Ruth St. Denis in her autobiography An Unfinished Life not to mention the thoroughly informative diary entries and charming letters published in Soaring by Jane Sherman - one of the youngest dancers on the Denishawn tour in 1925-26 and who passed away in 2010 at just over 100 years of age.